A classic and elegant design featuring New Zealand's most iconic flower, the Pohutukawa also known as the New Zealand Christmas tree as it can be found blooming along New Zealand's coastline right in time for Christmas. This Compact Mirror is the ideal size to carry around in your handbag or keep for easy access in your car. 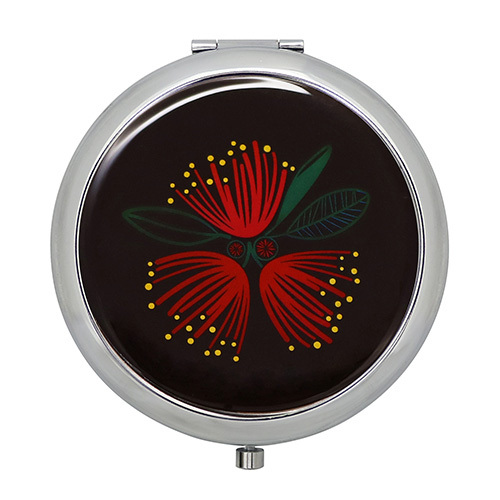 Every lady needs a pocket mirror and what better way than in this beautiful design. Pocket Mirror Material: Zinc Alloy Metal. Image is protected by an epoxy sticker to provide scratch resistance and shine.